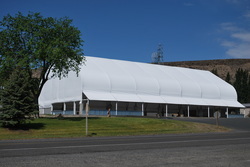 Our Pavilion is great for multiple types of events. Over 10,000 square feet of space, bright, open and view of the river. With a 2000 person capacity, we have the ability to host big to small, meetings to anniversaries, car shows to fruit markets. Give us a call, and come take a look: (509) 856-2800.